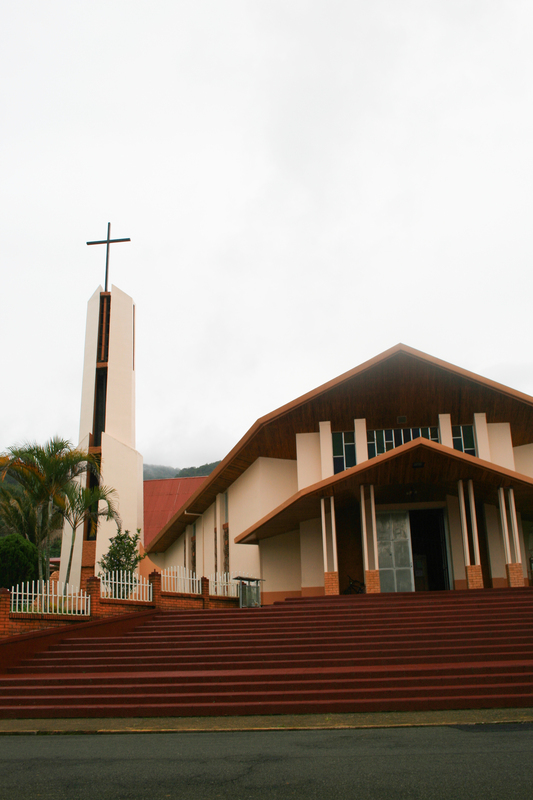 In most of the farming towns in the Tarrazú region, the local church is the focal point. 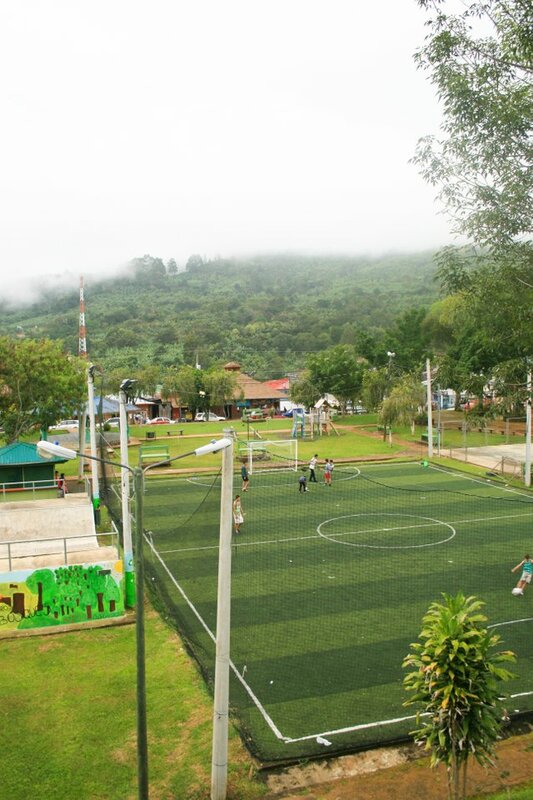 The above photo was taken in San Marcos, the capital city of the Tarrazú canton in Costa Rica. 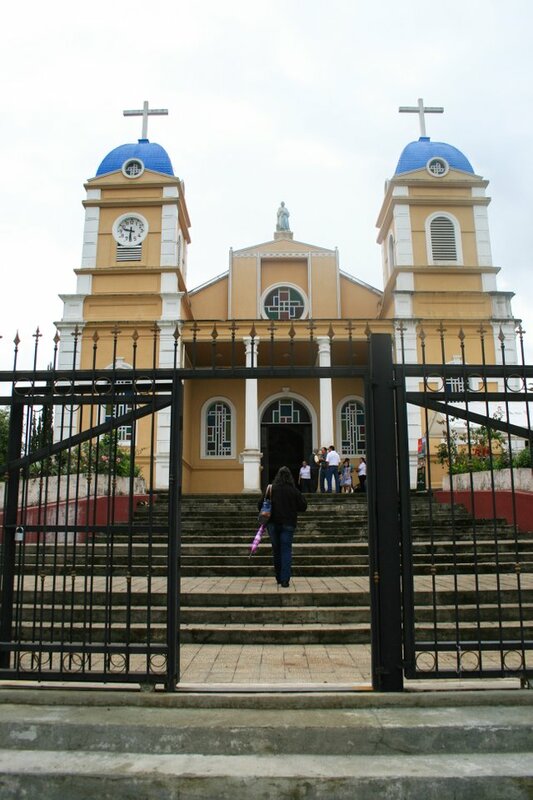 The population of San Marcos is around 10,000 and the Roman Catholic Church plays a large role in their culture - including their holiday schedules and town celebrations. Just across the street from the front entrance of the church is the town square where weekly markets and events take place, but we currently do not have any images of them. (We will have to schedule a trip for this soon!) However, we do have an image of the front entrance to the church. Just a couple of miles up the road, there is the town of San Pablo. It rests on the western slope of one of the many mountains in the area and its church overlooks the small town and the next ridge. Across the street and down some stairs is the town square, which consists of a small soccer field, a half pipe, swings, a gazebo, and other fun things to do in the park. About a 15-20 minute drive to the west - through winding turns and a steep drop to a valley below, then back up a mountain again - is the small town of Llano Bonito. Townspeople are scarce in these parts and the local hot spot is Pipasa, a small convenience store and café that can seat about eight people. 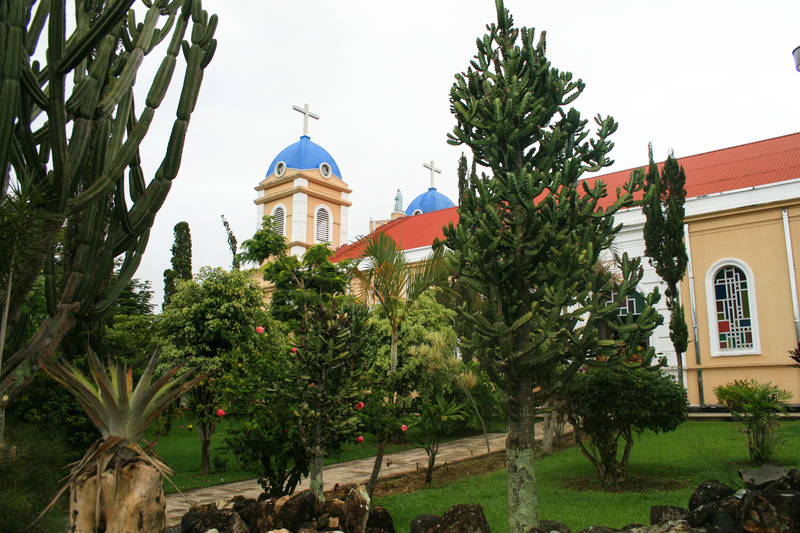 When we arrived in Llano Bonito for the first time, some afternoon rain was moving in and we captured this shot of the church. The differences between the town churches are stark, but there's virtually no impact on the faith and happiness of the people in these towns. The one thing that ties all of them together is their reliance on and their love of coffee farming and the culture that surrounds it. They don't have as much in terms of material wealth as other countries and people, but they are grateful for what they do have: A rich, faithful and coffee farming tradition that they can share with their families and pass on to their children. looks like great place to visit, thanks for sharing @bloggingforbeans! the first thing that strikes me about the churches, despite their size differences, is how colourful they are. It is interesting how faith is often tied to the land, as if the people have a tactile sense of the presence of God. And then, there are the natural rhythms - the heat of the day, followed predictably, by late afternoon storms. A lovely post. A lot of nice churches there. I really like the modern brick and wood one. These are some really great architectural photos. Of the set this one is my favorite. First off I love the complementary colors of the red/adobe in the foreground and the green/pale leaf. I also like the sense of distance produced by the foreground element of the fence posts. I also like how the gradated gray of the sky makes all of the colors stand out. wow wonderful photos.. and the churches are very colorful.. keep steeming! !